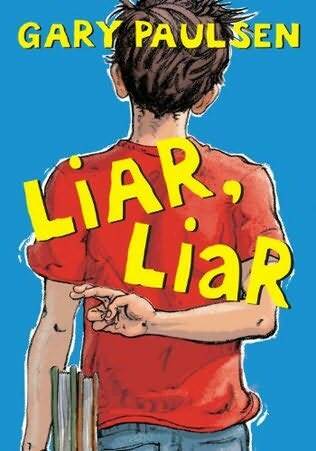 January's Children's Book Club selection was Liar, Liar: The Theory, Practice, and Destructive Properties of Deception by Gary Paulsen. This amusing tale tells the story of Kevin, a perpetual liar who thinks that his lies are told for the good of everyone. When Kevin develops a crush, his lies know no limits so that he can pursue the girl of his dreams. Soon, Kevin lies have his friends, family, and teachers at odds with each other and with him. When the truth comes out, can Kevin admit his mistakes and make it up to everyone? And will this latest whopper be his last? Our third and fourth grade readers really enjoyed this book. We worked together on fill-in-the-blanks of "the character I wouldn't want to share a locker with is____" and "What's the worst lie you have ever told? (Feel free to fib!)". The answers were both funny and enlightening. Harry wouldn't want to share a locker with Kevin, since he might take Harry's things and lie about it! And Cameron would like Jon Paul or Daniel on his soccer team since they are both very athletic and could help out his team. Andreas didn't get the worksheet but he commented on the book from NYC, saying that "the funny part was when Sarah and Daniel complain about not having their car". I agree with Andreas; Sarah and Daniel are always complaining! All in all, our reader response to this book was good. It averaged a 3.45 out of 5 stars. The book for February's Children's Book Club, to be held on Wednesday, February 1st from 3:00 p.m. to 4:00 p.m.---NOTE THE CHANGE IN DAY AND TIME!! !---is Wonkenstein: The Creature from My Closet by Obert Skye. Hope to see you there!